For more information, see Bladder Cancer, as well as Pathologic Findings in Small Cell Bladder Carcinoma and Cystoscopy. Cystoscopically, squamous cell carcinoma appears nodular and has a plaquelike, irregular surface with involvement of multiple bladder sites. The lateral wall and trigone are more commonly involved. [3, 14, 15] Grossly, the tumor seems nodular with deep invasion into the muscularis propria and often involves the extravesical organs. Most of the tumors are large, exophytic, and necrotic and bulge into the bladder cavity. [16, 17] Flat tumors with irregular borders are less common. Surface necrosis and keratin debris are usually present, which give it a flaky, whitish appearance. Microscopically, the squamous cell tumors arise in the epithelium and infiltrate in sheets, nests, and islands (see the images below); they resemble epidermal tumors, with some combination of individual cell keratinization, keratin pearls, and intercellular bridges. Transurethral resection of bladder tumor (TURBT) biopsies may contain only keratinous debris. Keratinization of the cells at the stromal interface is a sign of invasion. Squamous cell carcinoma. Note the infiltration into the muscularis propria by small nests and individual tumor cells. Squamous carcinoma in situ adjacent to the tumor. Grossly the tumor is a warty, exophytic mass that projects into the bladder lumen. Microscopically, it appears as a prominent papillary mass with acanthosis. The tumor grows in bulbous fronds of well-differentiated, acanthotic epithelium. There is minimal atypia and pushing margin without increased mitoses. It may focally resemble condyloma and has been reported to be associated with human papillomavirus (HPV); however, no firm link to HPV infection has been established. [8, 24] Generally, the verrucous carcinoma is considered low risk for progression; however, this is difficult to establish in the bladder because of a relatively fewer number of cases. What is squamous cell carcinoma (SCC)? Which gross findings are characteristic of squamous cell carcinoma (SCC)? Which microscopic findings are characteristic of squamous cell carcinoma (SCC)? What is verrucous squamous cell carcinoma (SCC)? What is basaloid squamous cell carcinoma (SCC)? What is the role of immunohistochemistry in the diagnosis of squamous cell carcinoma (SCC)? Which molecular alterations and genetic mutations are associated with squamous cell carcinoma (SCC)? How is squamous cell carcinoma (SCC) graded? Fischer-Valuck BW, Michalski JM, Contreras JA, et al. A propensity analysis comparing definitive chemo-radiotherapy for muscle-invasive squamous cell carcinoma of the bladder vs. urothelial carcinoma of the bladder using the National Cancer Database. Clin Transl Radiat Oncol. 2019 Feb. 15:38-41. [Medline]. [Full Text]. American Society of Clinical Oncology (ASCO). Bladder cancer: introduction. Cancer.Net. Available at https://www.cancer.net/cancer-types/bladder-cancer/introduction. October 2017; Accessed: January 24, 2019. Martin JW, Carballido EM, Ahmed A, et al. Squamous cell carcinoma of the urinary bladder: systematic review of clinical characteristics and therapeutic approaches. Arab J Urol. 2016 Sep. 14 (3):183-91. [Medline]. [Full Text]. American Cancer Society. What is bladder cancer?. Available at https://www.cancer.org/cancer/bladder-cancer/about/what-is-bladder-cancer.html. January 26, 2016; Accessed: January 24, 2019. Wong MCS, Fung FDH, Leung C, Cheung WWL, Goggins WB, Ng CF. The global epidemiology of bladder cancer: a joinpoint regression analysis of its incidence and mortality trends and projection. Sci Rep. 2018 Jan 18. 8 (1):1129. [Medline]. American Urological Association. Squamous cell carcinoma. Available at https://www.auanet.org/education/auauniversity/education-products-and-resources/pathology-for-urologists/urinary-bladder/non-urothelial-carcinomas/squamous-cell-carcinoma. Accessed: January 24, 2019. Jorgensen KR, Hoyer S, Jakobsen JK, et al. Human papillomavirus and squamous cell carcinoma of the urinary bladder: DaBlaCa-10 study. Scand J Urol. 2018 Dec 11. 1-6. [Medline]. Chapman-Fredricks JR, Cioffi-Lavina M, Accola MA, et al. High-risk human papillomavirus DNA detected in primary squamous cell carcinoma of urinary bladder. Arch Pathol Lab Med. 2013 Aug. 137 (8):1088-93. [Medline]. Blochin EB, Park KJ, Tickoo SK, Reuter VE, Al-Ahmadie H. Urothelial carcinoma with prominent squamous differentiation in the setting of neurogenic bladder: role of human papillomavirus infection. Mod Pathol. 2012 Nov. 25 (11):1534-42. [Medline]. Ginori A, Barone A, Santopietro R, Barbanti G, Cecconi F, Tripodi SA. Human papillomavirus-related basaloid squamous cell carcinoma of the bladder associated with genital tract human papillomavirus infection. Int J Urol. 2015 Feb. 22 (2):222-5. [Medline]. Shigehara K, Namiki M. Editorial comment to Human papillomavirus-related basaloid squamous cell carcinoma of the bladder associated with genital tract human papillomavirus infection. Int J Urol. 2015 Feb. 22 (2):225-6. [Medline]. Izard JP, Siemens DR, Mackillop WJ, et al. Outcomes of squamous histology in bladder cancer: a population-based study. Urol Oncol. 2015 Oct. 33 (10):425.e7-13. [Medline]. Action Bladder Cancer UK. Types of bladder cancer. Available at http://actionbladdercanceruk.org/types-of-bladder-cancer/. Accessed: January 24, 2019. Sakkas JL. Clinical pattern and treatment of squamous cell carcinoma of the bladder. Int Surg. 1966 Jan. 45 (1):71-6. [Medline]. Johnson DE, Schoenwald MB, Ayala AG, Miller LS. Squamous cell carcinoma of the bladder. J Urol. 1976 May. 115 (5):542-4. [Medline]. Sarma KP. Squamous cell carcinoma of the bladder. Int Surg. 1970 May. 53 (5):313-9. [Medline]. Bessette PL, Abell MR, Herwig KR. A clinicopathologic study of squamous cell carcinoma of the bladder. J Urol. 1974 Jul. 112 (1):66-7. [Medline]. Newman DM, Brown JR, Jay AC, Pontius EE. 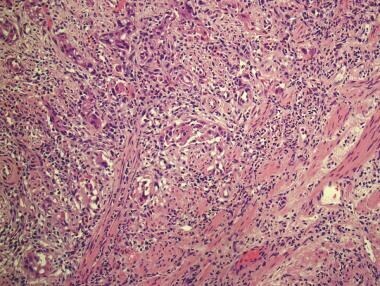 Squamous cell carcinoma of the bladder. J Urol. 1968 Oct. 100 (4):470-3. [Medline]. Mazaris E, Nafie S, Boustead G. Is TURBT able to cure high risk recurrent superficial or muscle invasive bladder cancer: factors resulting in pT0 radical cystectomy specimens. Int Braz J Urol. 2013 May-Jun. 39 (3):364-70. [Medline]. Neves TR, Soares MJ, Monteiro PG, Lima MS, Monteiro HG. Basaloid squamous cell carcinoma in the urinary bladder with small-cell carcinoma. J Clin Oncol. 2011 May 20. 29 (15):e440-2. [Medline]. Holck S, Jorgensen L. Verrucous carcinoma of urinary bladder. Urology. 1983 Oct. 22 (4):435-7. [Medline]. Blackmore CC, Ratcliffe NR, Harris RD. Verrucous carcinoma of the bladder. Abdom Imaging. 1995 Sep-Oct. 20 (5):480-2. [Medline]. Boileau M, Hui KK, Cowan DF. Invasive verrucous carcinoma of urinary bladder treated by irradiation. Urology. 1986 Jan. 27 (1):56-9. [Medline]. Walther M, O'Brien DP 3rd, Birch HW. Condylomata acuminata and verrucous carcinoma of the bladder: case report and literature review. J Urol. 1986 Feb. 135 (2):362-5. [Medline]. Vakar-Lopez F, Abrams J. Basaloid squamous cell carcinoma occurring in the urinary bladder. Arch Pathol Lab Med. 2000 Mar. 124 (3):455-9. [Medline]. 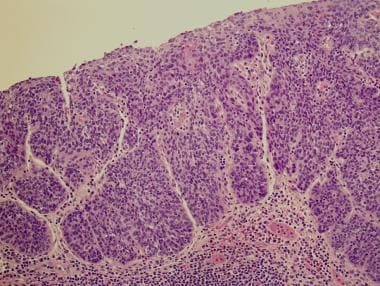 Bostwick GD, Cheng L. Neoplasms of the urinary bladder. Bostwick GD, Cheng L, eds. Urologic Surgical Pathology: Expert Consult. 2nd ed. Philadelphia, Pa: Elsevier/Mosby; 2008. 309. Wu RL, Osman I, Wu XR, et al. Uroplakin II gene is expressed in transitional cell carcinoma but not in bilharzial bladder squamous cell carcinoma: alternative pathways of bladder epithelial differentiation and tumor formation. Cancer Res. 1998 Mar 15. 58 (6):1291-7. [Medline]. [Full Text]. Gee JR, Montoya RG, Khaled HM, Sabichi AL, Grossman HB. Cytokeratin 20, AN43, PGDH, and COX-2 expression in transitional and squamous cell carcinoma of the bladder. Urol Oncol. 2003 Jul-Aug. 21 (4):266-70. [Medline]. Aly MS, Khaled HM. Chromosomal aberrations in early-stage bilharzial bladder cancer. Cancer Genet Cytogenet. 2002 Jan 1. 132 (1):41-5. [Medline]. El-Rifai W, Kamel D, Larramendy ML, et al. DNA copy number changes in Schistosoma-associated and non-Schistosoma-associated bladder cancer. Am J Pathol. 2000 Mar. 156 (3):871-8. [Medline]. [Full Text]. Fadl-Elmula I, Kytola S, Leithy ME, et al. Chromosomal aberrations in benign and malignant bilharzia-associated bladder lesions analyzed by comparative genomic hybridization. BMC Cancer. 2002 Mar 22. 2:5. [Medline]. [Full Text]. Gonzalez-Zulueta M, Shibata A, Ohneseit PF, et al. High frequency of chromosome 9p allelic loss and CDKN2 tumor suppressor gene alterations in squamous cell carcinoma of the bladder. J Natl Cancer Inst. 1995 Sep 20. 87 (18):1383-93. [Medline]. Muscheck M, Abol-Enein H, Chew K, et al. Comparison of genetic changes in schistosome-related transitional and squamous bladder cancers using comparative genomic hybridization. Carcinogenesis. 2000 Sep. 21 (9):1721-6. [Medline]. Pycha A, Mian C, Posch B, et al. Numerical chromosomal aberrations in muscle invasive squamous cell and transitional cell cancer of the urinary bladder: an alternative to classic prognostic indicators?. Urology. 1999 May. 53 (5):1005-10. [Medline]. Shaw ME, Elder PA, Abbas A, Knowles MA. Partial allelotype of schistosomiasis-associated bladder cancer. Int J Cancer. 1999 Mar 1. 80 (5):656-61. [Medline]. [Full Text]. Habuchi T, Takahashi R, Yamada H, et al. Influence of cigarette smoking and schistosomiasis on p53 gene mutation in urothelial cancer. Cancer Res. 1993 Aug 15. 53 (16):3795-9. [Medline]. [Full Text]. Ramchurren N, Cooper K, Summerhayes IC. Molecular events underlying schistosomiasis-related bladder cancer. Int J Cancer. 1995 Jul 28. 62 (3):237-44. [Medline]. Warren W, Biggs PJ, el-Baz M, Ghoneim MA, Stratton MR, Venitt S. Mutations in the p53 gene in schistosomal bladder cancer: a study of 92 tumours from Egyptian patients and a comparison between mutational spectra from schistosomal and non-schistosomal urothelial tumours. Carcinogenesis. 1995 May. 16 (5):1181-9. [Medline]. Abdulamir AS, Hafidh RR, Kadhim HS, Abubakar F. Tumor markers of bladder cancer: the schistosomal bladder tumors versus non-schistosomal bladder tumors. J Exp Clin Cancer Res. 2009 Feb 25. 28:27. [Medline]. [Full Text]. Przybojewska B, Jagiello A, Jalmuzna P. H-RAS, K-RAS, and N-RAS gene activation in human bladder cancers. Cancer Genet Cytogenet. 2000 Aug. 121 (1):73-7. [Medline]. Rabbani F, Cordon-Cardo C. Mutation of cell cycle regulators and their impact on superficial bladder cancer. Urol Clin North Am. 2000 Feb. 27 (1):83-102, ix. [Medline]. Guo CC, Gomez E, Tamboli P, et al. Squamous cell carcinoma of the urinary bladder: a clinicopathologic and immunohistochemical study of 16 cases. Hum Pathol. 2009 Oct. 40 (10):1448-52. [Medline]. Badawi AF, Cooper DP, Mostafa MH, et al. O6-alkylguanine-DNA alkyltransferase activity in schistosomiasis-associated human bladder cancer. Eur J Cancer. 1994. 30A (9):1314-9. [Medline]. Badawi AF, Mostafa MH, Aboul-Azm T, Haboubi NY, O'Connor PJ, Cooper DP. Promutagenic methylation damage in bladder DNA from patients with bladder cancer associated with schistosomiasis and from normal individuals. Carcinogenesis. 1992 May. 13 (5):877-81. [Medline]. Fadl-Elmula I, Gorunova L, Lundgren R, et al. Chromosomal abnormalities in two bladder carcinomas with secondary squamous cell differentiation. Cancer Genet Cytogenet. 1998 Apr 15. 102 (2):125-30. [Medline]. Lundgren R, Elfving P, Heim S, Kristoffersson U, Mandahl N, Mitelman F. A squamous cell bladder carcinoma with karyotypic abnormalities reminiscent of transitional cell carcinoma. J Urol. 1989 Aug. 142 (2 pt 1):374-6. [Medline]. Vanni R, Scarpa RM, Nieddu M, Usai E. Cytogenetic investigation on 30 bladder carcinomas. Cancer Genet Cytogenet. 1988 Jan. 30 (1):35-42. [Medline]. Faysal MH. Squamous cell carcinoma of the bladder. J Urol. 1981 Nov. 126 (5):598-9. [Medline]. Richie JP, Waisman J, Skinner DG, Dretler SP. Squamous carcinoma of the bladder: treatment by radical cystectomy. J Urol. 1976 Jun. 115 (6):670-2. [Medline]. Winkler HZ, Nativ O, Hosaka Y, Farrow GM, Lieber MM. Nuclear deoxyribonucleic acid ploidy in squamous cell bladder cancer. J Urol. 1989 Feb. 141 (2):297-302. [Medline]. Shaaban AA, Javadpour N, Tribukait B, Ghoneim MA. Prognostic significance of flow-DNA analysis and cell surface isoantigens in carcinoma of bilharzial bladder. Urology. 1992 Mar. 39 (3):207-10. [Medline]. Udager AM, McDaniel AS, Hovelson DH, et al. Frequent PD-L1 protein expression and molecular correlates in urinary bladder squamous cell carcinoma. Eur Urol. 2018 Oct. 74 (4):529-31. [Medline]. Abdel-Rahman O. Squamous cell carcinoma of the bladder: a SEER database analysis. Clin Genitourin Cancer. 2017 Jun. 15 (3):e463-8. [Medline]. Zhang X, Zhang M, Hou Y, et al. Single-cell analyses of transcriptional heterogeneity in squamous cell carcinoma of urinary bladder. Oncotarget. 2016 Oct 4. 7 (40):66069-76. [Medline]. [Full Text]. Rausch S, Lotan Y, Youssef RF. Squamous cell carcinogenesis and squamous cell carcinoma of the urinary bladder: a contemporary review with focus on nonbilharzial squamous cell carcinoma. Urol Oncol. 2014 Jan. 32 (1):32.e11-6. [Medline].